An Armadillo in GTA Vice City Stories. The Armadillo is a helicopter used by Vice City's fire department to put out fires in 1984, the setting of Grand Theft Auto: Vice City Stories. Similar in design to the Bell 412, the Armadillo is a relatively large helicopter that nevertheless possesses relatively good speed, with moderately steep pitches that help increase its acceleration at the expense of losing altitude faster. The fire department version has a bucket attached by a rope, which is used to carry water from the sea to the fires. Entering a FDVC Armadillo starts a Fire Copter side mission, where the player has to get sea water and use it to take out fires on rooftops. The player can avoid activating the side mission and water bucket upon entry into the helicopter by pushing it away from its spawn point using a heavy road vehicle or even the player character itself (by sprinting against the helicopter). Since the VCN Maverick was cut from GTA Vice City Stories, Reni Wassulmaier uses the Armadillo in one of his missions as a news helicopter, hovering over the player. A bucket-equipped Armadillo hovering over the sea in GTA Vice City Stories. The Air Ambulance, which shares the same body design as the Armadillo. 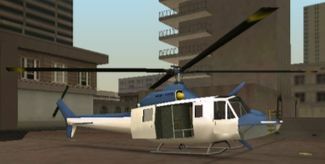 The police helicopter and helicopter in GTA III, also based on a Bell 412. This page was last modified on 6 August 2012, at 22:54.